In 1996, the St. Louis Cardinals selected Clapp in the 36th round (1,058th overall) of the Major League Baseball Amateur Draft. He worked his way through the system and spent three seasons in AAA Memphis before getting the call in 2001. In 23 games with the Cardinals, Clapp had five hits, including two doubles. The MLB record book officially lists him as a second baseman, but he also pinch hit and played in left field. 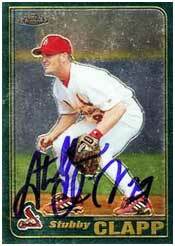 In St. Louis, he played under Hall of Fame Manager Tony La Russa, and with sluggers Mark McGuire and Albert Pujols. Clapp was well regarded in Memphis: during his four years with the Redbirds (1999-2002) he was fondly referred to as the “Mayor of Memphis”; in his last year there, the 5-foot-8 Clapp was featured on a kids’ growth chart; he also had the singular distinction of having his own bobble head. Stubby was known for doing a back flip every time he took the field. He was popular in Syracuse too, as he was wherever he played. He retired in 2006. In 911 minor league games, Clapp hit .270, had 48 homers, 50 triples, 196 doubles, 365 RBI, and 83 steals. He pitched in three games: in 2.1 innings, he gave up two hits and no earned runs. Post-retirement, Stubby Clapp has held coaching positions within the Houston Astros and Toronto Blue Jays’ organizations. He is currently a batting coach with the minor league New Hampshire Fisher Cats.